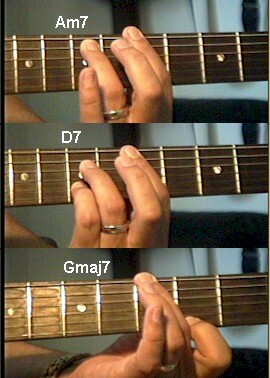 Lyle: In the chord chart above you see the Am7 for one measure (4 beats), to the D7 for one measure, to the Gmaj7 for two measures, completing a 4 bar groove in G.
Lyle: In the Jazz style you want to know how to play as many different minor chords in place of the Am7, as many different D dominant chords in place of the D7, and as many different G major type chords in place of the Gmaj7 chord on the chart. Lyle: Just because the chart says to play an Am7 doesn't always mean you have to play an Am7, you could replace it with an Am9 or Am11. Lyle: So in this lesson you will learn 7 different ways to play this little 4 bar chord progression, with countless possibilities after that to mix it up any way you want. Lyle: Now try a new way to play these chords. 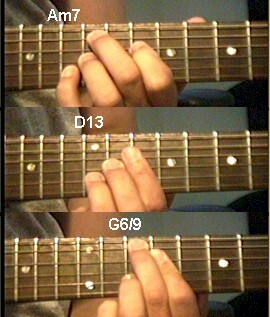 This time you'll substitute a D9 chord in place of the D7 for more "color". 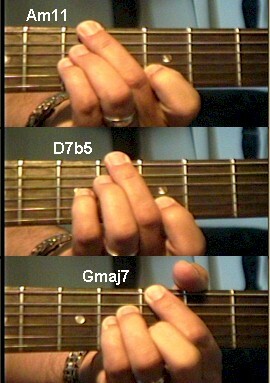 Lyle: Not all chords use all 6 strings. You'll need to get good at muting the strings that are not being used. David: Muting? 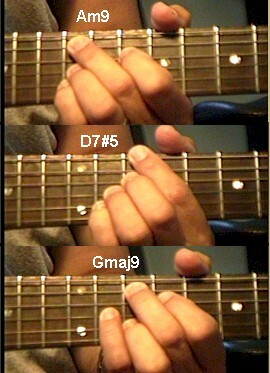 By barely pressing the 5th string with your 1st finger so it doesn't play? Lyle: Muting is by touching the string with the skin of a finger, not pressing on it, but just slightly touching it. Lyle: The next version replaces the Am7 with Am11, the D7 is replaced with a D7b5 and the Gmaj7 stays the same. Notice you're getting much more harmonic structure from playing these fancy chords rather than playing just the plain Am7 etc. 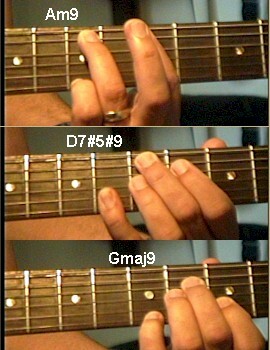 TomH: Many of the notes are the same between those chords. Skedman: This is great Lyle. Very inspiring. I need a fresh approach to my rhythm playing. Lyle: I work on rhythm ideas in upcoming lessons. Lyle: These might be the ones you would normally finger. These should sound very "common" as far as their harmonic structure goes. 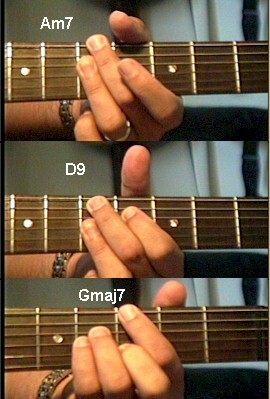 Lyle: Memorize as many of the chords and their names that you can from this lesson. 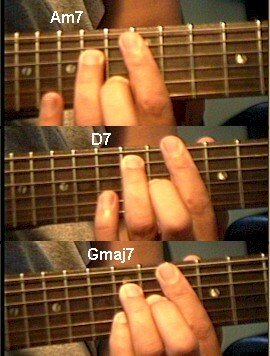 Lyle: In the lesson sample from the top of this lesson I played all 7 of these chord examples in order just like you learned. Lyle: I had to write them down in a way that I could remember what version of each chord I was going to play next. Lyle: Each one of these examples gives you a new sound and something cooler to play other than what the chord chart asks you to play. Skedman: Can you transcribe the lead in the example? pacer: So can you mix them up, the chords? Skedman: Thanks. Kinda sounds like Spongebob music. Lyle: Reminds me of Mr. Ed the talking horse. Skedman: Yeah that too, lol. Lyle: That's all for this lesson. You have a lot to study. You'll be tested on it next week!